Department of Physics, Indian Institute of Science, Bangalore, India. We theoretically study electronic and emergent properties of quantum matters. 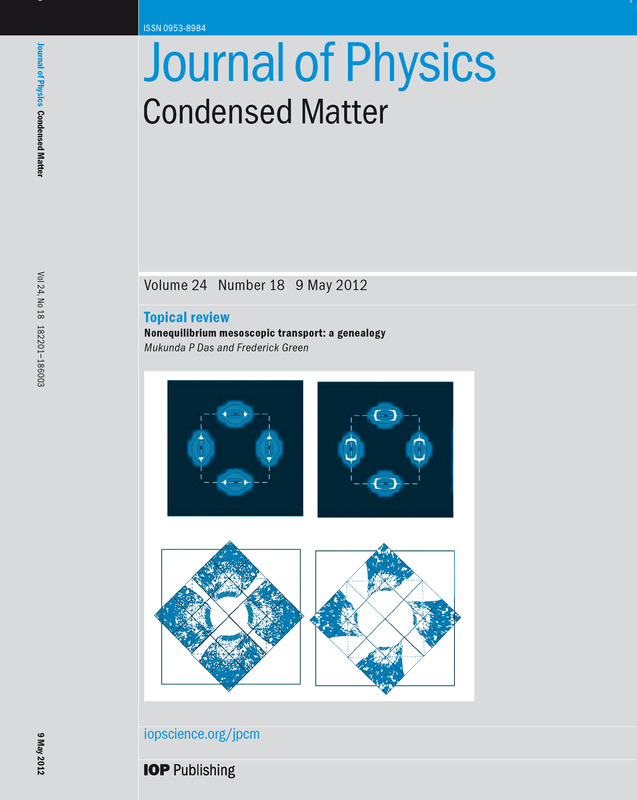 Journal of Physics: Condensed Matter (Topical Review) (2019). Review of Modern Physics 88, 021004 (2016). Advances in Physics 63, 151-266 (2014). New Journal of Physics 18, 103033 (2016). Journal of the Indian Institute of Science 96, 77-106 (2016).pdf. Philosophical Magazine (Published online 2014). Journal of Material Research 28, 659-672 (2013) [Invited]. Physical Review Letter (Appected) (2019). Physical Review B (accepted) (2019). Physical Review B 99, 054503 (2019). Journal of Physics: Condensed Matter 31, 085701 (2019). Physical Review B 98, 035418 (2018). Physical Review B 97, 235306 (2018). Physical Review B 98, 155408 (2018). Physical Review B 97, 155120 (2018). Physical Review B 97, 014512 (2018). Physical Review Letters 119, 226802 (2017). Physical Review B 96, 125154 (2017). Physical Review B 95, 235151 (2017). Physical Review B 95, 165425 (Rapid Communications) (2017). 65. Evidence for trivial Berry phase and absence of chiral anomaly in semimetal NbP. Scientific Reports 7, 46062 (2017). Journal of Physics: Condensed Matter 28, 294001 (2016). pdf. Physical Review Letters 116 197002 (2016). Physical Review B 93, 134515 (2016). Nano Letters 16 1042–1049 (2016). Physical Review B 92, 205133 (2015). Nature Communications 6, 8118 (2015). Physical Review B 92, 035127 (2015). 56. Two distinct topological phases in the mixed valence compound YbB6 and its differences from SmB6. Physical Review B 91, 155151 (2015). Physical Review B 91, 094510 (2015). Scientific Reports 5, 8632 (2015). Nano Letters 15, 80-87 (2015). Journal of Applied Physics 117, 17C741 (2015). Nano Letters 14, 2505-2508 (2014). Physical Review B 89, 045135 (2014). New Journal of Physics 15, 093045 (2013). Physical Review B 88, 064504 (2013). 46. Engineering three dimensional topological insulators in Rashba-type spin-orbit coupled heterostructure. 45. Topological dangling bonds with large spin splitting and enhanced spin polarization on the surfaces of Bi2Se3. H. Lin, Tanmoy Das, Y. Okada, M. Boyer, W. D. Wise, M. Tomasik, Bo Zhen, E. Hudson, W. Zhou, V. Madhavan, C.-Y. Ren, H. Ikuta, A. Bansil. Nano Letters 13, 1915-1919 (2013). 44. Field-angle-resolved anisotropy in superconducting CeCoIn5 using realistic Fermi surfaces. Physical Review B 87, 174514 (2013). 43. Discerning electronic fingerprints of nodal and antinodal nestings and their phase coherences in doped cuprate superconductors. Physical Review B 87, 144505 (2013). Physical Review B 87, 155123 (2013). . Physical Review B 87, 121202 (Rapid comm.) (2013). Physical Review Letters 109, 246406 (2012). Physical Review X 2, 041012 (2012). Physical Review Letters 109, 187006 (2012). Scientific Reports 2, 596 (2012). Physical Review B 86, 214512 (2012). Physical Review B 86, 064527 (2012). Physical Review B 85, 144510 (2012). J. Superconductivity & Novel Magnetism 26, 1673-1677 (2013). Physical Review B 85, 224535 (2012). Physical Review B 85, 144526 (2012). Physical Review B 86, 024511 (2012). J. Superconductivity & Novel Magnetism 25 2135 (2012). Physical Review B 85, 214504(2012). Physical Review B 85, 224529 (2012). Nano Letters 12, 927 (2012). J. Phys. : Cond. Mat. (First Track Comm.) 24, 182201 (2012). J. Phys. : Condens. Matter 24, 294206 (2012). Physical Review B 85, 064510 (2012). Physical Review B 85, 075104 (2012). Physical Review Letters 108, 017001 (2012). 19. Two energy scales in the magnetic resonance spectrum of electron and hole doped pnictide superconductors. Physical Review Letters 106, 157004 (2011). 18. Stripes, spin resonance and nodeless dx2-y2-pairing symmetry in FeSe-based layered superconductors. Physical Review B 84, 014521 (2011). Physical Review B 84, 115117 (2011). 16. Local suppression of the superfluid density of PuCoGa5 in the Swiss Cheese model. Physical Review B 84, 134510 (2011). 15. An isolated Dirac cone on the surface of ternary tetradymite-like topological insulators. New Journal of Physics13, 09500513 (2011). 14. Topological insulators in the quaternary chalcogenide compounds and ternary famatinite compounds. New Journal of Physics13, 085017 (2011). 13. Strong correlation effects and optical conductivity in electron doped cuprates. Europhysics Letters 96 27004 (2011). Physical Review B 83, 115117 (2011). Physical Review B 82,224501 (2010). Journal of Physics and Chemistry of Solids 72 , 341-346 (2010). Physical Review B 81, 174504 (2010). Physical Review B 81, 184515 (2010). J. Elect. Spect. Rel. Phenom. 181 23-27 (2010). Physical Review B 80, 214520 (2009). Physical Review B 77, 134516 (2008). Journal of Physics and Chemistry of Solids 69, 2963 (2008). Physical Review Letters 98, 197004 (2007). Physical Review B 74, 020506(R) (2006). Physica B: Condensed Matter 367, 6 (2005). 3. Spin fluctuations, Fermi surface hotspots and nesting in PuCoGa5. 2. Pairing symmetries of several families of iron-based superconductors and some similarities with cuprates and heavy-fermions. Europhysics Journal: Web of Conference 23, 00014 (2012). 1. Material specific correlation effect in several actinides. MRS proceeding 1444, 169 (2012). Our work is quoted on the cover image of Journal of Physics: Condensed Matter. News article on our work.